The department of heritage and environment are investigating the death of hundreds of fish in the Brisbane River at Lowood. DEAD and bloated catfish are washing up on the banks of the Brisbane River in their thousands, leaving scientists searching for an explanation. SeqWater officers were seen scouring the banks of the river just outside the centre of Lowood yesterday, where scaly bodies were scattered along rocky sections of the bank or bobbing belly-up in the steady current. It is believed hundreds of fish were found dead last week and more were counted yesterday – totalling in the thousands. 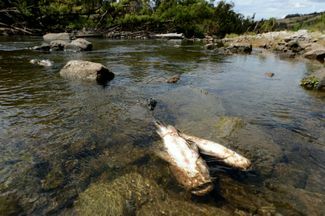 The dead fish were found as far upstream as the Lockyer Creek. Only catfish seem to have been affected, leading to speculation that a virus may be sweeping through fish populations in the river.